1 Centro de Biotecnologia. Universidade Federal de Pelotas, Campus Universitário, 96010-900, Pelotas - RS, Brazil. Mycobacterium bovis BCG has been proposed as an effective live vector for multivalent vaccines. The development of mycobacterial genetic systems to express foreign antigens and the adjuvanticity of BCG are the basis for the potential use of this attenuated mycobacterium as a recombinant vaccine vector. Stable plasmid vectors without antibiotic resistance markers are needed for heterologous antigen expression in BCG. Our group recently described the construction of a BCG expression system using auxotrophic complementation as a selectable marker. In this work, LipL32 and LigAni antigens of Leptospira interrogans were cloned and expressed in M. bovis BCG Pasteur and in the auxotrophic M. bovis BCG ΔleuD strains under the control of the M. leprae 18kDa promoter. Stability of the plasmids during in vitro growth and after inoculation of the recombinant BCG strains in hamsters was compared. The auxotrophic complementation system was highly stable, even during in vivo growth, as the selective pressure was maintained, whereas the conventional vector was unstable in the absence of selective pressure. These results confirm the usefulness of the new expression system, which represents a huge improvement over previously described expression systems for the development of BCG into an effective vaccine vector. Key terms: recombinant BCG, Auxotrophic complementation, foreign antigens. Mycobacterium bovis BCG is an attractive candidate for the development of live recombinant vaccines. BCG offers unique advantages as a vaccine: (1) it is unaffected by maternal antibodies and therefore can be given at any time after birth; (2) BCG is usually given as a single dose eliciting a long-lasting immunity; (3) it is stable and safe; (4) BCG can be administrated orally; and (5) it is inexpensive to produce when compared to other live vaccines. The extraordinary adjuvant properties of mycobacteria make them an attractive vector for the development of recombinant vaccines (Stover et al., 1991; Bastos et al., 2009). Indeed, antigens from bacteria,parasites, and viruses have been expressed in BCG and tested for this purpose (Bastos et al., 2002; Varaldo et al., 2004; Seixas et al., 2007a; da Silva Ramos et al., 2008). In addition, it has been shown that heterologous antigens expressed by recombinant BCG (rBCG) can elicit both cellular and humoral immune responses (Dennehy & Williamson, 2005). Despite the success of heterologous antigen expression, and in some cases protection achieved when using rBCG, in vitro and in vivo instability of the recombinant vaccines has been reported (Medeiros et al., 2002; Michelon et al., 2006). This instability is observed mainly when replicative vectors are used, which are lost during BCG replication in vivo (Edelman et al., 1999). Integrative vectors are more stable (Dellagostin et al., 1993). However, their disadvantage is the reduced expression level of heterologous genes compared to that of multicopy plasmids. Thus, optimization of BCG as a vehicle for live recombinant vaccines requires improved strategies for stable antigen expression. We have recently described the construction of new M. bovis BCG expression vectors using an auxotrophic strain of M. bovis BCG and gene complementation as a selectable marker. Preliminary results indicate that this selectable system can be used to express foreign antigens in BCG, maintaining the selective pressure in vivo (Borsuk et al., 2007). In this report we evaluated the stability of the auxotrophic selection system, comparing it to the conventional system where antibiotic resistance is used as a selective marker. Leptospira interrogans antigens were used for the evaluation of expression stability. The animal species used was the Golden Syrian hamster, a model for animal leptospirosis. Stability was only observed with the new auxotroph complementation system. A BCG auxotrophic for the amino acid leucine was constructed by knocking out the leuD gene by unmarked homologous recombination as previously described (Borsuk et al., 2007). Expression of ΔleuD on a plasmid (pUP410) not only allowed complementation, but also acted as a selectable marker (Borsuk et al., 2007). To assess functional stability of the ΔleuD complementation system in vivo, the coding sequences for the L. interrogans antigens LipL32 and the non identical region of the LigA antigen (LigAni), together with the 18 kDa gene promoter from M. Leprae, were amplified by PCR as expression cassettes from pUS2000/lipL32 and pUS2000/ligAni vectors (Seixas et al., 2007b), and cloned into pUP410, an E. coli-mycobacteria shuttle vector that carries the ΔleuD gene, which allows auxotrophic complementation of the BCG ΔleuD strain (Borsuk et al., 2007). PCR products were ligated into the KpnI site of the pUP410 vector, replacing the hygR gene. The resulting vectors were named pUP410+Z/pL32/18kDa and pUP410+Z/gAm/18kDa. Competent mycobacterium cells were prepared as follows: M. bovis BCG Pasteur ΔleuD and M. bovis BCG Pasteur were grown in 5 ml to an optical density at 600 nm (OD600) between 0.8 and 1.0, diluted 100-fold in 100 ml of the same growth medium and incubated at 37 °C for 7 days in a shaker. To make competent cells, the cultures were incubated on ice for 1 h, harvested by centrifugation at 4,000 x g for 10 min at 4 °C, washed three times with 10% glycerol (4 °C) and resuspended in 1 ml of 10% glycerol. Electroporation was performed following standard methods (Parish & Stoker, 1998). Briefly, 100 [il electrocompetent cells were mixed with 0.5 -1 [ig plasmid DNA and electroporated in 0.2 cm gap electroporation cuvettes at 2.5 kV, 25 [iF and 800 Q using a Gene Pulser II (Bio-Rad). Immediately after electroporation, the cells were diluted in 1 ml of 7H9 broth and incubated at 37 °C for 24 h (M. bovis BCG) before plating on 7H10 agar containing the appropriate antibiotic. Transformants were selected after 21 days of incubation at 37 °C. The expression of LipL32 and LigAni in BCG was demonstrated by Western blot (WB), as previously described (Seixas et al., 2007b). Four-to-six-week-old hamsters were used to evaluate the in vivo stability of the rBCG. In the experiment, forty-eight animals were randomly allocated into four groups, twelve animals per group, and inoculated with approximately 106 CFU of rBCG in 100 \il of sterile PBS-T. Group one was inoculated with rBCG ΔleuD (pUP410+lipL32), group two with rBCG ΔleuD (pUP410), group three with rBCG Pasteur (pUP402+lipL32), and group four with rBCG Pasteur (pUP410). At weeks 2, 5, 8, 12, 16 and 18 after inoculation two animals per group were euthanized and the spleen was removed, homogenized, serially diluted in 7H9, and plated onto 7H10 with or without selection (L-leucine for rBCG ΔleuD, and kanamycin for rBCG Pasteur). The number of resulting colonies was compared. Stability was calculated by comparing the number of colonies on non-selective medium in relation to the number of colonies on selective medium. Antibody responses were monitored by indirect ELISA using purified rLipL32 or rLigAni. Polystyrene plates were coated overnight with 500 ng of rLipL32 or rLigAni per well, diluted in carbonate-bicarbonate buffer pH 9.6, washed three times and sera were diluted in 1: 50 PBS-T. After incubation for 1 h at 37 ºC, followed by three washes with PBS-T, goat anti-hamster IgG peroxidase conjugate (Serotec, USA) was added and the reaction visualized with o-phenylenediamine dihydrochloride (Sigma) and hydrogen peroxide. Absorbance was determined at 450 nm in Multiskan MCC/340 (Titertek Instruments, USA) ELISA reader. Mean values were calculated from serum samples assayed in duplicate. Auxotrophic BCG strains, when inside macrophages, are unable to access intracellular amino acids, thus they fail to grow in vivo (Bange et al., 1996). This important observation opened the possibility of using auxotrophic complementation as a selectable marker, an approach that has two main advantages: it provides active selection in vivo, unlike antibiotic resistance markers, and it abolishes the need for using an antibiotic resistance gene as a vector component. The auxotroph complementation system for stable cloning and expression of foreign genes in BCG is based on the use of a M. bovis BCG strain auxotrophic for the leucine amino acid. The cloning of the lipL32 or ligAni coding sequences, under expression of the M. leprae 18kDa gene promoter, into pUP410 resulted in the vectors named pUP410+lipL32/18kDa and pUP410+ligAni/ 18kDa, respectively. These were then used to transform M. bovis BCG Pasteur ΔleuD and M. bovis BCG Pasteur. Expression of LipL32 or LigAni in BCG was evaluated by Western blot using Monoclonal antibodies (MAbs) against LipL32 or LigAni (Fernandes et al., 2007). These MAbs recognized a protein of approximately 30 kDa in rBCG cell lysates expressing LipL32 and approximately 60 kDa in rBCG cell lysates expressing LigAni. In contrast, no band was detected in wild type BCG extract, demonstrating the specificity of these antibodies. Based on band intensities, the level of expression of LipL32 or LigAni shown by recombinant BCG grown in vitro was considered to be similar for all constructs used (Figure 1). Stability of M. bovis BCG Pasteur ΔleuD and M. bovis BCG Pasteur transformed with plasmids containing the ΔleuD gene as a selectable marker was evaluated in hamsters. Initial selection was carried out on medium without leucine for BCG ΔleuD or containing kanamycin for BCG Pasteur. Approximately 106 CFU of each strain were inoculated into hamsters. Hamsters were inoculated with BCG ΔleuD transformed with pUP410+lipL32/18kDa and pUP410+ligani/18kDa and BCG Pasteur transformed with the same vectors. Bacteria cells were recovered from the spleens of two animals killed at 2, 5, 8, 12, 16 and 18 weeks post inoculation and plated on selective and non-selective medium. The ratio of resistant (BCG carrying the plasmid vector) versus total BCG colonies were calculated for each strain. Stability of BCG ΔleuD and BCG Pasteur strains is shown in figure 2. Auxotrophic complementation vectors used to transform BCG ΔleuD showed 100% stability in vivo during the 18 weeks of the experiment (Figure 2). Conversely, the same vectors used to transform BCG Pasteur were lost during in vivo growth. At two weeks post-inoculation less than 50% of the bacterial cells still harboured the plasmid. This number fell to 7% at 18 weeks post-inoculation (Figure 2). 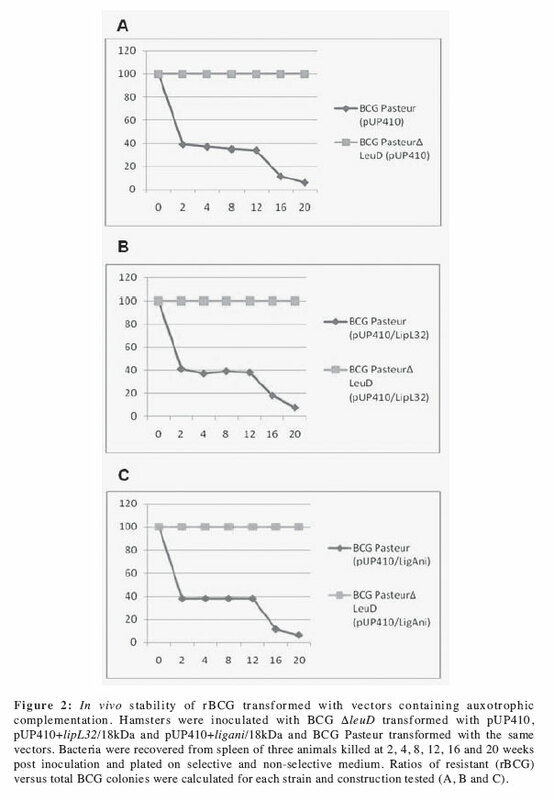 Interestingly, it was noted that there was no significant reduction in the number of CFU recovered from hamsters inoculated with BCG ΔleuD complemented strains in comparison to rBCG Pasteur. A difference would be expected as BCG ΔleuD cells that lose the plasmid fail to survive due to the unavailability of exogenous leucine inside macrophage cells. In a similar experiment performed in mice, a high level of functional stability was also observed as all the recovered BCG ΔleuD transformed with vectors carrying lacZ gave rise to blue colonies when plated onto medium containing X-gal (Borsuk et al., 2007). The humoral immune response against both leptospiral recombinant antigens induced by rBCG Pasteur ΔleuD and rBCG Pasteur expressing the leptospiral antigens was evaluated by ELISA at 42 days after vaccination. No difference between the two strains could be observed at the evaluated point in time. The reason for that is probably that when the vaccine is administered the level of expression of the foreign antigen is high in both strains. The loss of the plasmid vector in the rBCG Pasteur strain that occurred after inoculation will only result in a lower immune response in the long term. The use of auxotrophic complementation as a selectable marker for expression of foreign genes in BCG described in this report provides the high levels of stability previously described only for integrative vectors (Mederle et al., 2002). However, it has the advantage of a multicopy vector, namely higher levels of foreign antigen expression. In addition, the stability of the auxotrophic complementation system is of utmost importance for the expression of heterologous antigens. The permanence of the expression vector in rBCG offers the possibility of continued production of the recombinant antigen, constantly stimulating the immune system. An appropriate immune response against the recombinant antigen may depend on the length of time the immune system is stimulated. In addition, an antibiotic resistance gene would not be allowed in a live recombinant vaccine. In our study the kanamycin resistance gene was still present, as it was required for selection in the BCG Pasteur strain. However, the pUP410 vector was constructed in such a way that a simple restriction digestion and re-ligation are sufficient for removing the kanamycin resistance gene prior to transformation of BCG ΔleuD strain (Borsuk et al., 2007). This vector can be used to clone and express virtually any foreign gene in BCG. Confirmation of rBCG stability during in vitro growth using the auxotrophic complementation system as selectable marker had previously been demonstrated only in mice (Borsuk et al., 2007). This is the first report of evaluation of rBCG stability in hamster. Recombinant BCG expressing LipL32 antigen from L. interrogans has been shown to protect hamsters from a lethal challenge, using a conventional expression system (Seixas et al., 2007a). We are confident that the improved stability provided by the auxotrophic complementation system will be able to further enhance the immune response elicited by rBCG expressing LipL32, conferring a higher protection level. Experiments are currently been conducted to test this hypothesis. If confirmed, other rBCG vaccine candidates that have already been demonstrated to induce protection in animal model experiments (Connell et al., 1993; Buddle et al., 1995; Abomoelak et al., 1999; Demangel et al., 2005; Dennehy et al., 2007; Seixas et al., 2007a) could also be further improved by the use of the new expression system. Received: 15-10-2008. In revised form: 30-11-2009. Accepted: 11-12-2009.